Another DIY scrub, you ask? Hellllllls yes. I’m obsessed. The Target Dollar Spot is only fueling that obsession with these cute little containers that I keep finding. 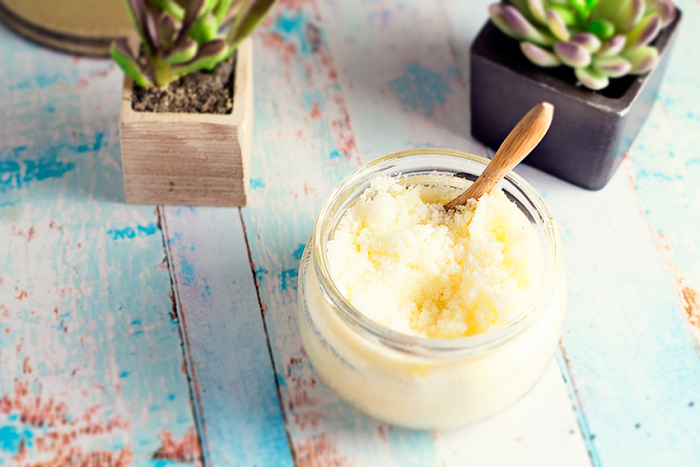 This DIY Coconut & Rose Body scrub has the perfect home inside of this tiny glass jar. My DIY kick really knows no bounds. Did you see the Peppermint Bath Salts I put over on Pink Heels Pink Truck? They’re fantastic. Don’t forget to check out our Bubblegum Lip Scrub and Coconut & Honey lip scrub, you won’t be sorry! Today’s body scrub is inspired from this amazing rosehip seed oil that I got my hands on. I knew immediately that it would lend itself nicely to some DIY beauty products and I was super excited to get started. Rosehip Seed oil offers so many healing properties, often used as a remedy for scars, dark spots, wrinkles, and premature aging. So why not throw it in a body scrub that you can use all over? You can also use it on it’s own as a facial serum and in so many other recipes so you’re really getting a lot of bang for your buck! The other ingredients are things that you most likely already have in your cabinet or can pick up in a quick trip to Walmart. Coconut Oil, sugar, and olive oil. They match up perfectly with the rosehip seed oil to give you a super moisturizing sugar scrub that you can use all over. You want to start with a separate bowl for mixing. Put your coconut oil in the microwave for about 15 seconds to melt it down just a little bit to make things easier when mixing. Add in your sugar to the melted coconut oil. Next up you’ll add in the olive oil and the rosehip seed oil and start mixing it all together. You have to put a little bit of elbow grease into the mixing to be sure that it all meshes together nicely. Once it’s all mixed together you can go ahead and transfer it over into your glass container that has an air tight lid on it. If you want it to keep nicely, make sure you tighten that lid on there. I store mine in our bathroom cabinet and you can probably get a few months out of it. You can pick up the rosehip seed oil here for $13.50! Let me know if you try this scrub out and how you like it! I bought the exact same container from the dollar spot for a DIY… great minds think alike!!! That looks good, I’ll have to try it. I heard so much about rose hip oil lately, I really should try some. This looks lovely! I bet it smells wonderful. Thanks for sharing. Thank you for this awesome DIY recipe! I love oils and scrubs– so I will definitely have to make this! Thank you!!!!!! Ok, I seriously need to make this! !